I love myself, and I'm not afraid to say it. Hello and welcome to Week 47 of #HOMwork! I get asked a lot about where my I get my creative confidence. While there are multiple factors that contribute to my confidence in my work, one of the most important things I’ve learned over the course of my career is that it starts with self-love. Being able to celebrate what’s good about myself and owning it is essential to running my own business, teaching my own classes, and staying creatively fulfilled. It’s not vanity, it’s self-appreciation for all of the hard work I do. And recognition that yeah, I am a badass. And YOU are too. Loving yourself fully takes time and practice. Acts of self-love can be big, like following your dreams to pursue a more fulfilling career because you know you deserve to do something that you love every day. They can also be small, like posting something you’re proud of to Instagram because you believe that the art you make is worthy of being seen. Showing up for yourself is one of the best things you can do for your career. I think often about this quote from Brene Brown, “We can only love others as much as we love ourselves.” Basically, until we truly accept and love ourselves, we won’t have much to offer the rest of the world. This week's #HOMwork assignment is to make a card that expresses the love you have for yourself. 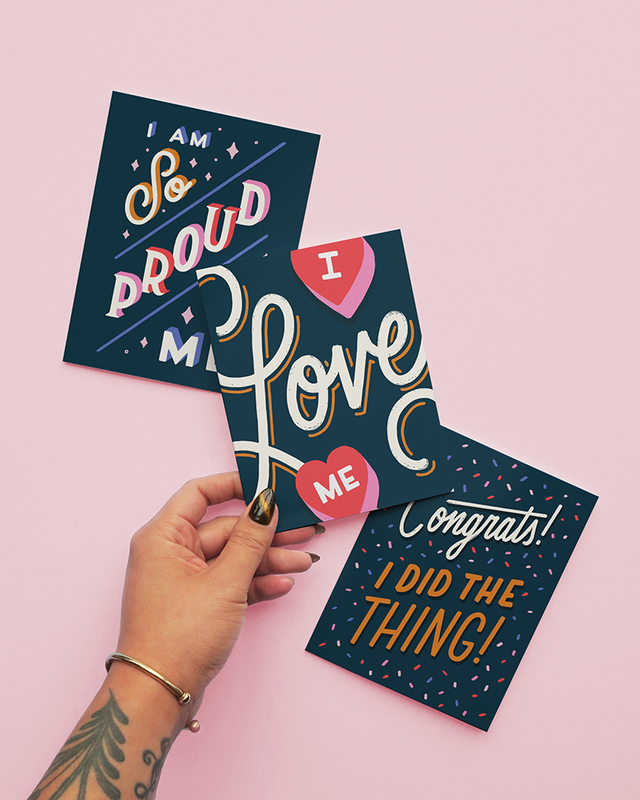 Think of a card you would typically give to someone else that you love, admire, or respect and then flip it so that it's all about you! As always, post your work using the hashtag #HOMwork. In the caption, tell us at least 1 thing you love about yourself. It could be something you're really good at or an accomplishment you're proud of. This is your chance to brag a little bit and pay yourself the compliments you deserve. If you're hesitant to participate in this challenge because celebrating yourself still feels a bit like bragging, you can always preface your post with "@homsweethom challenged me to do this, so...". Don’t forget to tag me @homsweethom in your posts so I can see what you love about yourself. I'll be sharing my faves in my Stories all week! P.S. If you want to see how I quickly vectorized my self-love card in the example image, check out this tutorial!